At the conclusion of the examination, we gathered around the new Godan, and the finger imprints from the teachers slapping his shoulders resonated red and were buried deep in his sweat-covered skin. Just being newly minted black belts, we worked our way around his torso, calling out, “look at this one,” as we discovered with reverence more marks left on his body from the test. At the conclusion of the examination, we gathered around the new Godan, and the finger imprints from the teachers slapping his shoulders resonated red and were buried deep in his sweat-covered skin. Just being newly minted black belts, we worked our way around his torso, calling out, “look at this one,” as we discovered with reverence more marks left on his body from the test. We, I would come to learn, had bought into the falsehood that these marks indicated good, strong karate. Shime testing is a two-person drill which serves as a way of testing a practitioner's ability to apply the strategies and tactics of sanchin kata. The idea behind the testing is to have the practitioner, the person being tested, placed under a load, to see how their structure is working. To do this, shime testing is used. 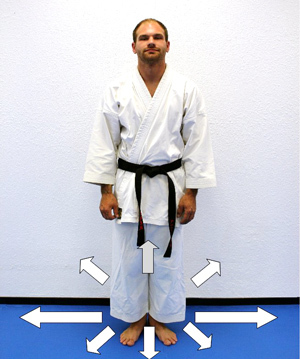 The person being tested will be performing the kata and then there will be a second person who is testing their body. The testing is made up of putting pressure on the practitioner’s body with intent to find the weak spots in the structure, the goal being discovery, so the practitioner can correct a weakness. What is considered to be classical testing, striking the practitioner with impetus is actually a modern affection. This form of testing is incorrect in its application and also its goal. To gather some perspective around the idea of shime, take a look at the word. Shime translates to mean: to lock, tighten, or shut. This word is used in regard to the practitioner’s ability to lock the body down, to tighten, and to shut off the areas of vulnerability. Shime is all about the performer of the kata and little to do with the tester. Percussive striking doesn't allow the practitioner to understand the feedback within their body; it is only a test of will, and of the student’s ability to take punishment. However, the application looks very impressive, stinging slaps and pounding fists are outwardly great displays of power. Power begets power, the harder you hit the practitioner, the more intensely they respond, the more power they use to hold their ground. Percussive striking forces the body into a form of triage. The word triage comes from the medial field and is a means of analysis that determines the priority of treatment based on the severity and survivability of the injury. The body will instinctively use a method of triage to address the force of the strike and not analyze the test. If the goal is the betterment of the student, and not a display, then this method of percussive striking is not helpful. It is a very difficult to analyze, and understand the feedback of a quick strike in a meaningful fashion. Sanchin kata is preformed at a slow pace allowing for audit of movement. In turn, the tester should honor this pace allowing the performer the building of an overarching and unified structure. 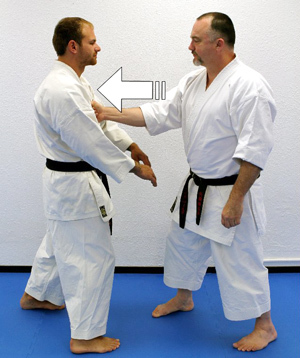 Often, during the performance of the sanchin kata, the tester will station themselves behind the practitioner and place both hands on the Trapezius muscle. These muscles run from the base of the skull to the lower thoracic vertebra on both sides of the body. For our purposes the Trapezius muscles serve as a shelf to place the tester’s palms. The first method of testing involves placing the tester’s palms on the practitioner’s shoulders (Trapezius muscles) and slapped down hard several times. The results regarding experience and education are poor as they are based on percussive force, or impact, and not load, being defined as resisting externally applied forces. The second, and preferred method, is to place the hands on the shoulders and then firmly pushing downward trying to drive the person into the ground. What is being tested is the flexibility of the spine as there should be none, the bones should be effectively stacked allowing for transfer of energy from the ground into a target. This method of slowly beginning to add load to the practitioner gives them an opportunity to audit their stance. During this testing a weakness, for example in the lower spine can be fixed by realignment. However by striking quickly and hard on the practitioner the experience is less favorable for study. In response to a strike the practitioner compresses and springs back into place using triage, with no time for subtlety. An example of slower testing is done by Underwriters Limited (UL). UL is famous for their testing of consumer products. When stress testing a product they will place it in a machine that will begin to assert a load onto the tested item, the load is increased until the product breaks. Similar methodologies are employed by IKEA when testing a chair by a machine that slowly and repeatedly sits down on the chair until the chair breaks. These two examples of product testing countermand the explosive and percussive methods of testing sanchin. UL and IKEA both seek information and not just a broken object, and sanchin testing should carry the same reasons and methodologies. The percussive striking of modern-day sanchin testing is not traditional and is not a pathway for success. In fact, it's a modern affection and lacks understanding of the goal of shime testing. The old method of testing sanchin kata is that of a building load and not percussion. The testing is built around allowing the student to study their body and the teacher teaching the student. An example of this is in my book, The Way of Sanchin Kata; The Application of Power and the follow up DVD, Sanchin Kata; Traditional Training for Karate Power. For those of you don't own the book, or DVD, here is a short version you can use. You will address the cardinal points of the compass on the human body, North, South, East, West, as well as the four intermediate directions. These points are also known in their classic Japanese terms, Happo Kuzushi, the classic eight directions of imbalance. 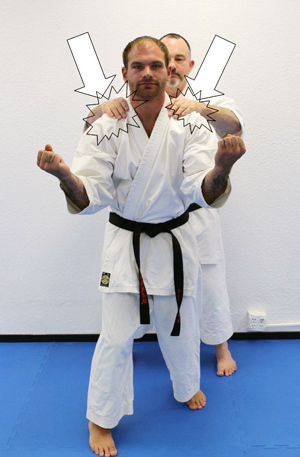 As the practitioner performs sanchin kata, use your fist to give pressure in a direction, for example, from front to back, (North to South) on the practitioner’s chest. Slowly increase the pressure until you feel the practitioner losing their structure. Then hold that position allowing them to adjust their body to meet the load you are placing on them. This is where wisdom and instruction come in as it is the tester’s responsibility to aid the practitioner by adding corrections to gain better performance. As you can see, the entire process of shime for sanchin kata is about cooperation and study, and not brute force. Sanchin is practiced in a dojo, “the hall of the way.” not at a competition. Study and learn, but more importantly adopt the old ways, study and learn smartly. The old guys knew what they were doing.